The interpretation of the results is aided by an examination of the standardized discriminant function coefficients, the structure correlations, and certain plots. 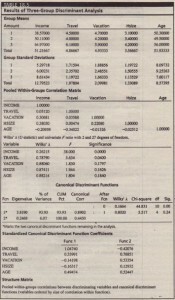 The standardized coefficients indicate a large coefficient for income on function I, whereas function 2 has relatively larger coefficients for travel, vacation, and age. A similar conclusion is reached by an examination of the structure matrix To help interpret the functions, variables with large coefficients for a particular function are grouped together. These groupings are shown with asterisks. 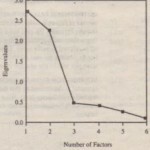 Thus, income and household size have asterisks for function I because these variables have coefficients that are larger for function I than for function 2. 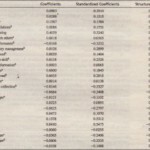 These variables are associated primarily with function 1. 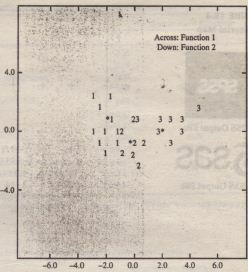 On the other hand, travel, vacation, and age are predominantly associated with function 2, as indicated by the asterisks. 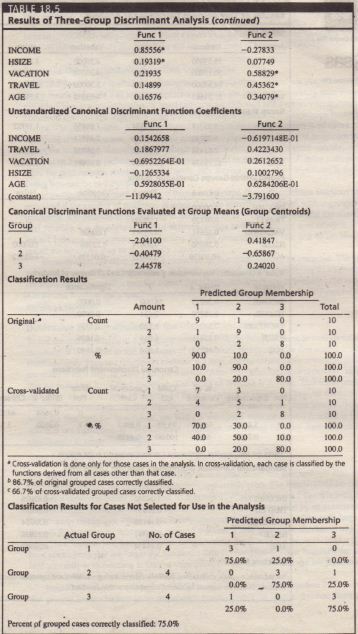 The Mahalanobis method was used to conduct a two-group stepwise discriminant analysis on the data pertaining to the visit variable in Tables 18.2 and 18.3. 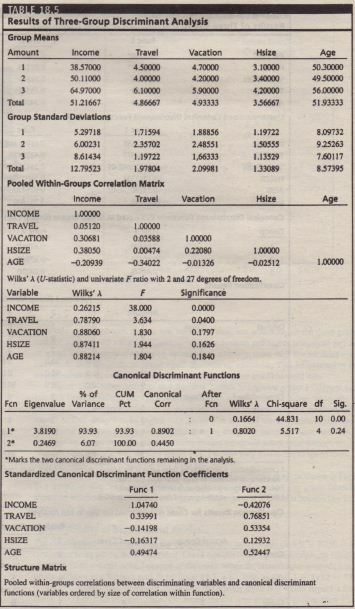 The first predictor variable to be selected was income, followed by household size and then vacation. The order in which the variables were selected also indicates their importance in discriminating between the groups. When the dependent variable.is binary and there are several independent variables that are metric, in addition to two-group discriminant analysis one can also use ordinary least squares (OLS) regression, the logit, and the probit models for estimation. The data preparation for running OLS regression, logit, and probit models is similar in that the dependent variable is coded as 0 or I. OLS regression was discussed in The probit model is less commonly used and will not be discussed, but we give an explanation of the binary logit model. Thus, when OLS regression is used, p is not constrained to lie between 0 and I; it is possible to obtain estimated values of p that are less than 0 or greater than \1. These values are, of course, conceptually and intuitively unappealing: We demonstrate this phenomenon in our illustrative application. 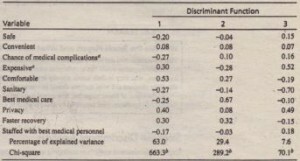 As in the case of discriminant analysis, the researcher should specify the objectives and clearly identify the binary criterion variables and the independent variables that will be considered in the analysis. 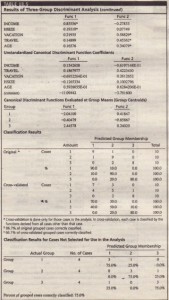 Moreover, the sample may have to be divided into the analysis and validation subsamples.